All that remains of the monastery established here in the 7th century by St Fintan Munna are these two portions of a large high cross. 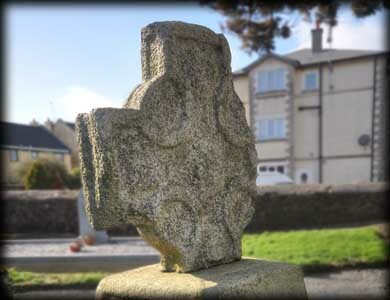 The cross is situated in the northwest corner of St Munna's Church of Ireland graveyard. 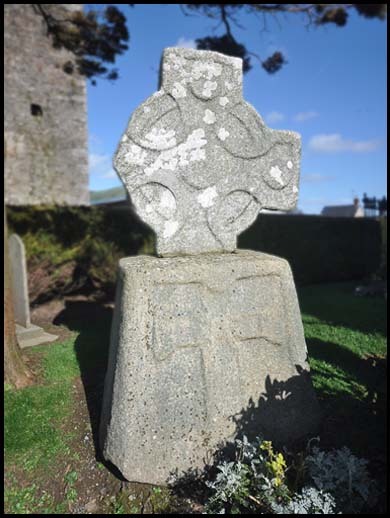 The shaft of the cross is missing and the head is turned on it's side and one of the arms is set in the granite base. The head is decorated on each side with moulding and bears five plain bosses on each face - one in the centre and one on each terminal. The huge truncated pyramidal shaped cross base stands 1.18 metres high and bears a ringless cross in false relief on one of the faces shown left. St. Fintan Munna (aka St Munna of Taghmon, St Fintan) was born around the middle of the 6th century. He was named Fionn, this was prefixed with the word Mo, meaning 'My Fionn' This changed over time to Munna. He studied at Devenish in Fermanagh and and at Kilmore in Cavan. After travelling to Iona, Scotland in 597 to visit St Colmcille. Munna founded several churches there before returning to Ireland where he visited East Clare. He finally came to Leinster and is associated with the fortified church at Taghmon in County Westmeath. He later established a church, known as Teach Munna, in Wexford. This was also shortened to Taghmon. Situated: From Wexford head west on the R769. Go straight through the Nev roundabout on to the N25. After 3.5 kilometres turn left (signposted Taghmon). At the next roundabout turn right. Go 6 kilometres to Taghmon. Discovery Map 77: S 9178 1979. Last visit Mar 2014.